I was recently visiting the Berkshires in western Massachusetts when a cold spell drifted in from the north. A flake of snow fell, the ground froze, and the conditions were ripe for some exploration of the surrounding country. During a walk, I came upon a tract of public land on the ridge east of the Tyringham Valley called The McLennan Reservation. A mile-and-a-half-long trail leads from the trailhead into a hollow through which a beautiful creek (Camp Brook) flows and then up to a Beaver Pond in a saddle on the ridge. Because of the cold weather, about 10 degrees F, the brook was frozen in places and adorned with all kinds of interesting and beautiful ice formations. I spent a couple of hours along the brook and made the following series of photographs. I’ll discuss how I made them and some suggestions for doing so yourself below. As you can tell from the blurred water in all of the photographs, these are time exposures; the duration of exposure varies from a half a second to 30 seconds in length. I will often use long exposures when photographing water because I like the effect. Long exposures, however, present some difficulties that are worth considering before you head off to the nearest creek to try them out. One of the challenges of doing time exposures is logistical. You need to haul a tripod with you, and you will often need some sort of filter in order to lengthen the duration of your exposure, especially on a sunny day. For some of these photographs, I was able to use no filter by setting the ISO on my camera to 200 (the lowest it goes) and stopping down the aperture on my lens to its smallest opening, f22 or f16. Doing so allowed me to lengthen the duration of exposure to around a half second or one second, long enough to get an adequate blur. For others, I resorted to a 1000x neutral density filter, which reduces the amount of light entering the camera by about 10 stops. By using this filter, I was able to make exposures in the area of 30 seconds or longer. I think this was a bit of overkill, a 5 stop (or 32x) filter would have been adequate and more efficient, but I only had one filter with me. A very long exposure does, however, affect the quality of light in the image in ways that I find pleasing. The second difficulty presented by time exposures is more composition oriented. Blurry water is indeed very pretty; oftentimes, interesting and unexpected shapes and tracks will appear in the image. But it is easy to become so fascinated by the effect that the images become rather clichéd and lose some of the visual tension that makes a photograph successful. 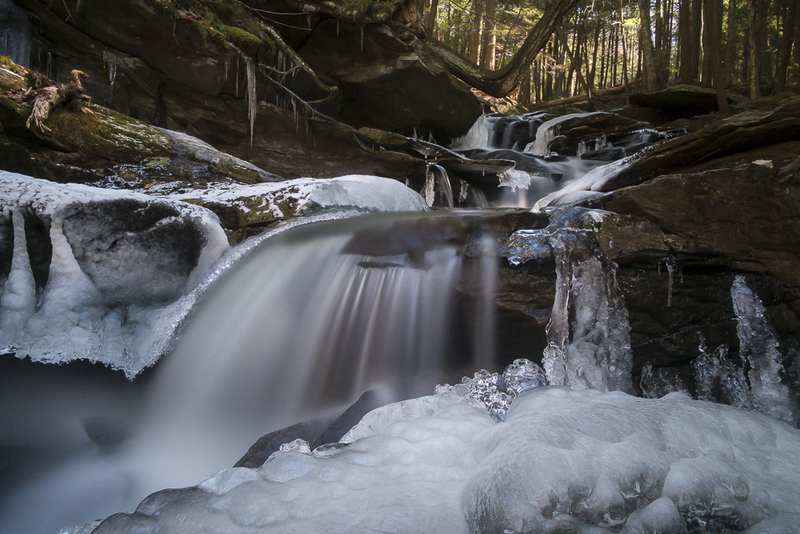 With these photographs, I decided to go with long exposures so that the sharp edges of the ice (and the rocks to some extent) would stand in contrast to the softness of the water. Doing so creates tension and drama. And because the creek was so deep in a shaded valley, I tried to compose the shots so that I could introduce some sunlight into the image when it was possible to do so. That too increased the visual tension. So those are just a couple of things that I took into account when making these photographs. Go out and try it yourself, and visit my website (http://mattwillen.com) to let me know how things work out for you.